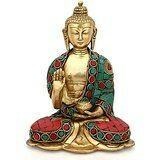 Enhance your home and garden by this graceful vintage finish 'Blessing Buddha Statue', symbol of peace and harmony. This large Buddha is in Abhaya pose and made of very high quality with detailed hand work. This would be a one of very exclusive statue in your collection. Such pieces are always very limited in quantity !! Antique Finish, Solid and Heavy Statue, Size : 6 Inches Height X 5 Inches wide X 3 Inches depth. Product Weight : Approx 1.2 KG (Packaging weight 2.5 KG), Material- Brass (metal) and Handwork of Turquoise Gemstones. -------------- Pls beware from Copy product & ensure buying authentic product. This is exclusive product of Brand " Collectible India" and "covered by intellectual property rights laws". 'Collectible India' do not authorize any other Brand/Seller to sell it and won't be responsible if any copy or substandard product send by any other seller.